VoxWeb, a social networking app that allows users to attach a 11-second audio clip to any image, has secured seed funding of $100,000 from CitrusPay co-founder Jitendra Gupta. VoxWeb is using the money, which was raised last year, for its ongoing expansion plans, said Yash Mishra, the company's 29-year-old founder. VoxWeb, which is run by Mumbai-based VoxWeb Pvt Ltd, has already launched its app in India, Europe and the US. Over the next eight weeks, the app will be launched in South Korea, Japan and parts of Africa. "VoxWeb is the first consumer internet product from India to be launched globallyâ€¦ response from the US and Europe has been positive and we are confident of getting more traction from all over the world in the coming months," Mishra said. VoxWeb allows users to interact using 'speaking pictures' or images with voice clips attached to them. 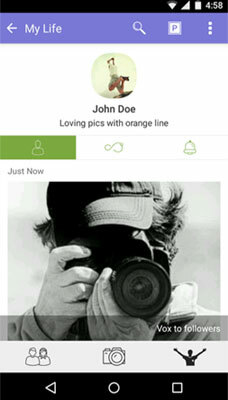 The app also features a social network called 'Life' which allows users to build their network and share images. "VoxWeb network structure or feed algorithm does not come in the way of the content creator and its willful audience, thus shifting the power back to content creators from network algorithms," said Mishra. VoxWeb, which was founded in June 2014, currently has a team of seven people. Before starting the company, Mishra, an alumnus of IIT Kanpur, worked as an analyst with JP Morgan. The social networking space is currently ruled by global giants such as Facebook, Twitter, Instagram and others. Gupta had started CitrusPay, which offers payment processing solutions, along with Satyen Kothari in 2011. Before that, he was director at Autus Capital. Citrus Payment Solutions Pvt. Ltd. Jitendra Gupta VoxWeb Pvt. Ltd.